The unfolding violence in Paris, Beirut, and Baghdad–together with the responses of some political leaders in America–requires faithful responses. I suggest prayer be our first response. 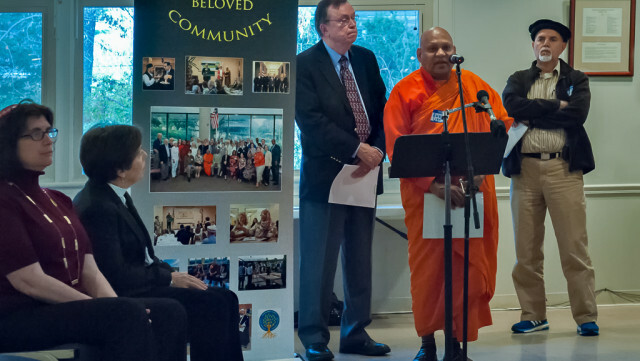 The photo here, from our countywide Faith Forum earlier this week, represents just one moment of offering prayers and words of encouragement from the scriptures our Buddhist, Christian, Hindu, Jewish, and Muslim traditions. The facts are that the terrorists are primarily killing Muslims and imams and Muslim organizations have been crying out in protest for years. The problem is that the media caters to controversy, Islamophobia is growing, and we have not been effective advocates for our Muslim sisters and brothers. I encourage you to forward the document linked above to your network of leaders and concerned individuals. It is also important that we be able to address the alleged threat posed by Syrian refugees entering our community. It is shameful that some politicians are catering to fear and prejudice rather than providing the facts and encouraging us to live according to the fundamental values of our faith and nation. The facts are that Syrian refugees are literally fleeing for their lives and those approved for entry to the United States have gone through a rigorous series of examinations for a period of 18 to 24 months. Most are multi-generational families with only about 2 percent being single males of combat age. Here is information from the White House Task Force on New Americans addressing this subject, and an article separating truth from fiction regarding Syrian refugees and addressing our responsibility. Our Faith Forum ended with a unanimous show of hands in favor of thanking our county executive and County Council for welcoming refugees and pledging to step up our efforts within faith communities to be welcoming and supportive. We had representatives from the agencies in Montgomery County responsible for receiving Syrian refugees and assimilating the 1,000 children fleeing violence in Latin America. Here is the county refugee resource sheet with contact information to help you act upon that for which we prayed on Tuesday. I have talked with my colleague, Jennifer Gray, who is responsible for interfaith outreach in Gov. Hogan’s Office of Community Initiatives, reporting on our Faith Forum. She was impressed and expressed interest in having the governor meet with us. I sent her information related to the vetting process for refugees entering the United States and materials related to President Obama’s phone conference with governors. I said we would welcome a meeting with the governor, assuming he has learned about the vetting process and is interested in working with us in welcoming Syrian refugees. Here is an article describing his position. You may contact his office at 100 State Circle, Annapolis, Maryland 21401-1925 or call 410-974-3901 or 800-811-8338. You may rest assured that County Executive Ike Leggett and County Council President George Leventhal are supportive of efforts to welcome refugees and immigrants. In these days of shock and sorrow, fear and prejudice, let us seek the presence of the Divine within and among us. Let us pray for the wisdom and the courage to lead our people along a path of justice and peace. I thank all who were present on Tuesday and look forward to the guidance and engagement of everyone as together we seek to create the Beloved Community in Montgomery County.